Super Bowl Sunday is just around the corner and the matchup is one for the ages. 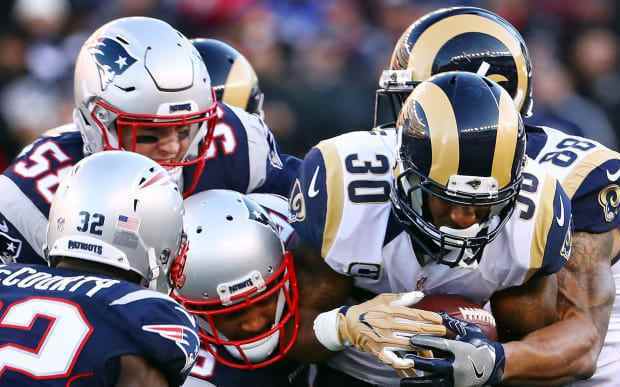 The new superstars of the NFL in the Los Angeles Rams are set to take on the dynasty of the New England Patriots. This matchup is anticipated by many for a multitude of reasons, but one in particular is the quarterback matchup. LA Rams quarterback Jared Goff is a 24 year old, third year quarterback out of the University of California, Berkeley. Tom Brady is a 41 year old, five time Super Bowl Champion, three time league MVP and 14 time Pro Bowl quarterback for the New England Patriots. It is a matchup between the past and the future of the league. The Los Angeles Rams started the 2018 regular season off red-hot, as they got out to an 8-0 record in the first half of the season. The Rams were putting up points with an explosive offense that included star quarterback Jared Goff, MVP candidate running back Todd Gurley, and the dynamic wide receiver lineup of Robert Woods, Brandin Cooks and Cooper Kupp. The Rams lost Kupp to a torn ACL in November and began to not look as threatening as they did in the first half of the season, as they lost two straight games to the Chicago Bears and the Philadelphia Eagles. The Rams would go on to rally during the latter part of the season and finish with a 13-3 record, winning the NFC West division. The Rams improving offense was reflected in their stats, the most impressive of which being Jared Goff, who threw for over 4,000 yards and 32 touchdowns in the season, earning him a spot in the pro bowl. Running back Todd Gurley ran for over 1,200 yards and 17 touchdowns, enough to also earn him a spot in the pro bowl. Both wide receivers Robert Woods and Brandin Cooks hauled in over 1,200 receiving yards and over five touchdowns each. The LA defense has also shown remarkable talent this season. Defensive tackle Aaron Donald made his presence felt on defense as he recorded 16.5 sacks, 20 tackles for a loss, amd 34 quarterback hits, which was a league best earning him a spot in the Pro Bowl. In the Postseason, the Rams beat the Dallas Cowboys 30-22 in the divisional round thanks to backup running back CJ Anderson. In the NFC Championship game, the Rams had to travel to New Orleans to take on Drew Brees and the Saints. This game was masked by a controversy over a no call made by the referees. In the late fourth quarter, Rams defensive back Nickell Robey-Coleman interfered with Saints wide receiver Tommylee Lewis making head to head contact, preventing him from catching the ball. Fans across the league were pleading for a pass interference call, but no call was made and the Rams won the game in overtime, sending them to Super Bowl LIII. The New England Patriots were being doubted by people all season long, after they lost the Super Bowl in 2017 to the Philadelphia Eagles. Many people thought their dynasty was over and that quarterback Tom Brady is on the decline. The Patriots did show some regression as they began the season, but they finished strong with an 11-5 record, winning the AFC East. Patriots quarterback Tom Brady made another Pro Bowl as he threw for over 4,000 yards and 29 touchdowns. The Patriots have a very versatile running game with James White, rookie Sony Michel and Rex Burkhead, all of which can catch and run the ball out of the backfield, which the Patriots have found success with. The Patriots have a dangerous receiving crew of the quick Julian Edelman, Chris Hogan, the dynamic Cordarrelle Patterson, and the insane strength of tight end Rob Gronkowski. The Patriots absolutely obliterated the Los Angeles Chargers in the divisional round of the playoffs, winning 41-28. The Patriots then traveled to Kansas City to take on the cinderella story Chiefs led by quarterback Patrick Mahomes in the AFC Championship game. With the game going into overtime, the Patriots were able to show what a well-coordinated team can do with those extra minutes, converting on the third down five times in one drive. This drove them down the field towards the end zone, scoring a touchdown, winning the game 37-31. The Patriots are in the Super Bowl for the fourth time in five years. The game is set to take place on Feb. 3, 2019 in Atlanta, GA.